Endotracheal tube is a flexible catheter, which is inserted in the trachea (wind pipe) of a patient, the process is called as endotracheal intubation. The endotracheal tube is used for various purposes such as providing artificial respiration where it is connected to a ventilator, which provides oxygen to patient’s lungs for assisting them in breathing. Endotracheal intubation is also performed during laryngoscopy, where a laryngoscope is inserted for viewing the vocal chords and upper part of the trachea. Another purpose of endotracheal intubation is delivery of anesthetic aid during surgical procedures and in removing the aspirated (breathed in) foreign body, which is obstructing the trachea. The endotracheal tube is made up of polyvinyl chloride, which is a transparent plastic and it is generally of 6mm inner diameter. The endotracheal tubes are of different types such as oral or nasal, preformed, reinforced, cuffed or uncuffed, and double-lumen endobronchial tubes. 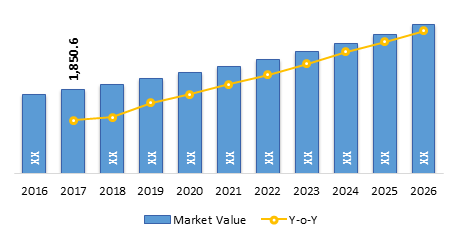 Frequent approvals of novel endotracheal tubes and their launches in developed economies are expected to significantly drive global endotracheal tube market growth over the forecast period. Key players in the market have gained regulatory approvals and have launched their products in the market. For instance, in 2017, the U.S. Food and Drug Administration (FDA) designated CeraShield, an endotracheal tube of NA Medical LLC, as a breakthrough device. Data from U.S. Centers for Disease Control and Prevention (CDC) shows that antimicrobial compound present in the CeraShield is capable of inhibiting growth of 100 strains of Candida auris, which causes lethal fungal infection. Moreover, approvals by regulatory agencies to key players for launching their product in new markets are further expected to boost the global endotracheal tube market growth over the forecast period. For instance, in 2017, Central Drugs Standard Control Organisation (CDSCO), under Indian Ministry of Health & Family Welfare, provided regulatory approval to Bactiguard’s infection protection endotracheal tubes (BIP ETT) in India. Company’s coated endotracheal tubes reduce the risk of respiratory infections by obstructing microbial adhesion and colonization. The BIP ETT’s have shown effective microbial adhesion reduction in In vitro studies with relevant clinical microbial isolates. These factors are expected to support global endotracheal tube market growth over the forecast period. The global endotracheal tube market size was valued at US$ 1,850.6 million in 2017, and is expected to witness a robust CAGR of 6.6% over the forecast period (2018–2026). Key players are constantly involved in business expansion to diversify their product portfolio in the market. For instance, in December 2016, Sanovas Inc., a company involved in medical intervention technology, announced the launch of its wholly owned subsidiary, Intubation Science, Inc. and LightSpeed Intubation System (LSI). LightSpeed intubation system provides a new approach for endotracheal intubation, making the procedure fast, safe, and easy. However, these products are associated with various problems and complications. For instance, common problem is growth of fungi and bacteria on endotracheal tubes, which can lead to potentially fatal respiratory infections. If during endotracheal intubation the tube is inadvertently positioned in the oesophagus, which is right below the trachea, adequate respiration cannot be achieved leading to cardiac arrest, brain damage, and ultimately death of the patient. If placed too deep, it results in partial ventilation i.e. respiration only to one lung which might result in pneumothorax. These factors are expected to restrain the global endotracheal tube market growth over the forecast period. Some of the major players operating in the global endotracheal tube market include, NA Medical LLC, Bactiguard, Kimberly-Clark, Medtronic Plc, Smiths Medical, Teleflex Inc., ConvaTec Inc., Neurovision Medical Products, Intersurgical Inc., Royax and Sanovas Inc. Different endotracheal tubes like Medtronic’s neural integrity monitor (NIM) electromyogram (EMG) endotracheal tubes, with various additional features like nerve monitoring, are being introduced in the market. Products with Additional features such as monitoring cuff pressure, EMG monitoring during intubation and others are being introduced in the market. Apart from manufacturers, research organizations are also involved in research and are focusing on improvising the current endotracheal tubes to avoid problems such as growth of bacteria and fungi on the tube, appropriate placement of the tube and others, associated with their use. For instance, University of Washington, in collaboration with National Heart, Lung, and Blood Institute (NHLBI) conducted clinical trials (study completed in 2016) of endotracheal tubes with different designs to check their use in preventing ventilator acquired pneumonia. During ventilation fluids leak from mouth and throat into lungs, which can cause pneumonia. These factors are expected to support endotracheal tube market growth over the forecast period. High success rate of endotracheal tubes is expected to have a positive impact on global endotracheal tube market growth over the forecast period. For instance, according to NCBI, out of 1838 cases studied, 38 met the inclusion criteria for pre-hospital tracheal intubation during the period 2006-2016. The overall success rate of tracheal intubation was found to be 0.96 (median value). Also, apart from ventilation in traumatic conditions, endotracheal intubation is also useful in post-surgery care, such as after lung cancer surgery endotracheal intubation is used to provide artificial respiration to the patient. Key companies covered as a part of this study include NA Medical LLC, Bactiguard, Kimberly-Clark, Medtronic Plc., Smiths Medical, Teleflex Inc., ConvaTec Inc., Neurovision Medical Products, Intersurgical Inc., Royax and Sanovas Inc.
*Browse 26 market data tables and 27 figures on "Endotracheal Tube Market - Global forecast to 2026”.